No one wants a blocked bathroom and is especially a nightmare if it is a blocked toilet. Overflowing water and sewage is not only horrible but can also be a health hazard and cause serious damage to your property. 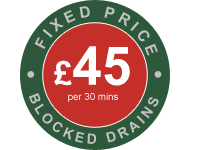 AlfaClear Drains engineers are here to help and with our team of fully trained engineers are sure to fix your problem quickly. or alternatively email us at info@alfacleardrains.com or complete and submit the form on the Contact Us page.